Difference between revisions of "Spoken Word"
The Word of the Lord God released in the original fiats of creation. The release of the energies of the Word, or the Logos, through the [[throat chakra]] by the Sons of God in confirmation of that lost Word. It is written, “By thy words thou shalt be justified, and by thy words thou shalt be condemned.” (Matt. 12:37) When man and woman reconsecrate the throat chakra in the affirmation of the Word of God, they become the instruments of God’s own commandments that fulfill the law of their re-creation after the image of the Son. Invocations offered by priests and priestesses of the sacred fire on [[Lemuria]] in this power of the spoken Word were originally given according to the science of the Logos. The perversion of this science in the practice of black magic occurred later, in the last days of Lemuria, bringing about the destruction of the temples of the Cosmic Virgin and the cataclysm that sank the continent. The Easter Island images are the remains, marking the site of the wars of the gods that shook the earth in those terrible days. By contrast, this science of the spoken Word was used in its pure form by the Israelites to fell the walls of Jericho. Today disciples use the power of the Word in decrees, affirmations, prayers, and mantras to draw the essence of the sacred fire from the I AM Presence, the Christ Self, and Cosmic Beings to channel God’s light into matrices of transmutation and transformation for constructive change in the planes of Matter. The Word of the L<small>ORD</small> God released in the original fiats of creation. The release of the energies of the Word, or the Logos, through the [[throat chakra]] by the Sons of God in confirmation of that lost Word. It is written, “By thy words thou shalt be justified, and by thy words thou shalt be condemned.”<ref>Matt. 12:37.</ref> When man and woman reconsecrate the [[throat chakra]] in the affirmation of the Word of God, they become the instruments of God’s own commandments that fulfill the law of their re-creation after the image of the Son. The Master of the [[Aquarian age]], [[Saint Germain]], teaches his disciples to invoke by the power of the spoken Word the violet flame for forgiveness of sins and for the baptism of the sacred fire in preparation for transition into the Higher Consciousness of God. Invocations offered by priests and priestesses of the sacred fire on [[Lemuria]] in this power of the spoken Word were originally given according to the science of the Logos. The perversion of this science in the practice of [[black magic]] occurred later, in the last days of Lemuria, bringing about the destruction of the temples of the Cosmic Virgin and the cataclysm that sank the continent. The Easter Island images are the remains, marking the site of the wars of the gods that shook the earth in those terrible days. By contrast, this science of the spoken Word was used in its pure form by the Israelites to fell the walls of Jericho. Today disciples use the power of the Word in decrees, affirmations, prayers, and mantras to draw the essence of the sacred fire from the [[I AM Presence]], the [[Christ Self]], and [[cosmic being]]s to channel God’s light into matrices of [[transmutation]] and transformation for constructive change in the planes of Matter. The master of the [[Aquarian age]], [[Saint Germain]], teaches his disciples to invoke by the power of the spoken Word the [[violet flame]] for forgiveness of sins and for the baptism of the sacred fire in preparation for transition into the Higher Consciousness of God. Assertion that something exists or is true; confirmation or ratification of the truth; solemn declaration. A positive statement, usually beginning with the name of God, “I AM,” that affirms and strengthens the qualities of God within oneself, helping to bring those qualities into physical manifestation. Affirmations are fiats which may be of greater length and more specific detail. 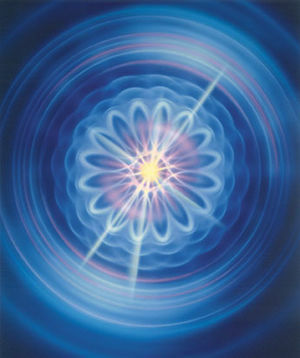 They affirm the action of Truth in man—in his being, consciousness, and world. They are used alternately with denials of the reality of evil in all of its forms. Likewise, they affirm the power of Truth that challenges the activities of the fallen ones. '''To call''': ''vb.'' to speak in a loud or distinct voice so as to be heard at a distance; to recall from death or the astral plane, e.g., “Lazarus, come forth!”; to utter in a loud or distinct voice; to announce or read loudly or authoritatively. The call is the most direct means of communication between man and God, and God and man, frequently used in an emergency; e.g., O God, help me! Archangel Michael, take command! A short, simple melody, especially one characterized by single notes to which an indefinite number of syllables are intoned, used in singing the psalms, canticles, etc., in the church service. In both East and West, the name of God is chanted over and over again in the ritual of atonement whereby the soul of man becomes one with the Spirit of God by intonation of the sound of His name. This is given in Sanskrit as [[AUM]] or AUM TAT SAT AUM and in English as [[I AM THAT I AM]]. By sounding the name of God or that of a member of the heavenly hosts, the vibration of the being is simulated and thereby Being itself is drawn to the one chanting. Therefore chants, when properly used, magnetize the Presence, whether universal or individualized, of the Divine Consciousness. ''n.'' a foreordaining will, an edict or fiat, an authoritative decision, declaration, a law, ordinance or religious rule; a command or commandment. ''v.'' to decide, to declare, to determine or order; to ordain, to command or enjoin; to invoke the presence of God, his light/energy/consciousness, his power and protection, purity and perfection. The decree is the most powerful of all applications to the Godhead. It is the command of the son or daughter of God made in the name of the [[I AM Presence]] and the Christ for the will of the Almighty to come into manifestation as Above, so below. It is the means whereby the kingdom of God becomes a reality here and now through the power of the spoken Word. It may be short or long and usually is marked by a formal preamble and a closing, or acceptance. An authoritative decree, sanction, order; a pronouncement; a short dynamic invocation or decree usually using the name of God, I AM, as the first word of the fiat, e.g., I AM the Way! I AM the Truth! I AM the Resurrection and the Life! Fiats are always exclamations of Christ-power, Christ-wisdom, and Christ-love consciously affirmed and accepted in the here and now. The act of invoking or calling upon a deity, spirit, etc., for aid, protection, inspiration, or the like; supplication; any petitioning or supplication for help or aid; a form of prayer invoking God's presence, said especially at the beginning of a public ceremony; a call to God or to beings who have become one with God to release power, wisdom, and love to mankind or to intercede in their behalf; supplication for the flow of light, energy, peace, and harmony to come into manifestation on earth as it is in heaven. A mystical formula or invocation; a word or formula, often in Sanskrit, to be recited or sung for the purpose of intensifying the action of the Spirit of God in man. A form of prayer consisting of a word or a group of words that is chanted over and over again to magnetize a particular aspect of the Deity or of a being who has actualized that aspect of the Deity. A devout petition to, or any form of spiritual communion with, God or an object of worship; a spiritual communion with God or an object of worship, as in supplication, thanksgiving, adoration, or confession; a formula or sequence of words used in or appointed for praying: the Lord’s Prayer; a petition, entreaty. The Word of the LORD God released in the original fiats of creation. The release of the energies of the Word, or the Logos, through the throat chakra by the Sons of God in confirmation of that lost Word. It is written, “By thy words thou shalt be justified, and by thy words thou shalt be condemned.” When man and woman reconsecrate the throat chakra in the affirmation of the Word of God, they become the instruments of God’s own commandments that fulfill the law of their re-creation after the image of the Son. To call: vb. to speak in a loud or distinct voice so as to be heard at a distance; to recall from death or the astral plane, e.g., “Lazarus, come forth!”; to utter in a loud or distinct voice; to announce or read loudly or authoritatively. A short, simple melody, especially one characterized by single notes to which an indefinite number of syllables are intoned, used in singing the psalms, canticles, etc., in the church service. In both East and West, the name of God is chanted over and over again in the ritual of atonement whereby the soul of man becomes one with the Spirit of God by intonation of the sound of His name. This is given in Sanskrit as AUM or AUM TAT SAT AUM and in English as I AM THAT I AM. n. a foreordaining will, an edict or fiat, an authoritative decision, declaration, a law, ordinance or religious rule; a command or commandment. v. to decide, to declare, to determine or order; to ordain, to command or enjoin; to invoke the presence of God, his light/energy/consciousness, his power and protection, purity and perfection. The decree is the most powerful of all applications to the Godhead. It is the command of the son or daughter of God made in the name of the I AM Presence and the Christ for the will of the Almighty to come into manifestation as Above, so below. It is the means whereby the kingdom of God becomes a reality here and now through the power of the spoken Word. It may be short or long and usually is marked by a formal preamble and a closing, or acceptance. An authoritative decree, sanction, order; a pronouncement; a short dynamic invocation or decree usually using the name of God, I AM, as the first word of the fiat, e.g., I AM the Way! I AM the Truth! I AM the Resurrection and the Life! Fiats are always exclamations of Christ-power, Christ-wisdom, and Christ-love consciously affirmed and accepted in the here and now. This page was last modified on 3 March 2017, at 00:33.